Prouve Antony Vitra Miniature Chair 1950. 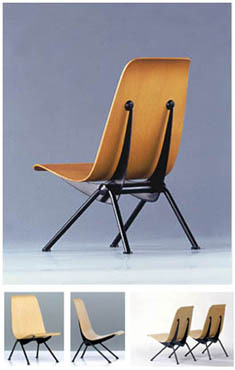 Vitra original miniature chair. This amazing and highly detailed miniature is an exact copy of the original large version! The miniature comes in a wooden box with a brochure which provides art-historical information on the background to the design, biography of the designer, and the production history of the respective chair. Miniature Antony, Designer: Jean Prouve, 1950. In 1955, Prouve participated, together with the French designer group Union des Artistes Modernes (which supported its members in participating in public tenders), in the competition for furnishings for the dormitory in Antony, near Paris. Co-operating with Charlotte Perriand, he manufactured an exemplary furniture series for the common rooms, the cafeterias and a series of rooms in the dormitory. They included the chair shown here, which Prouve had drafted as early as 1950 for the University of Strasbourg. Size: 5.71" x 3.35" x 4.53" (14.5 x 8.5 x 11.5cm).